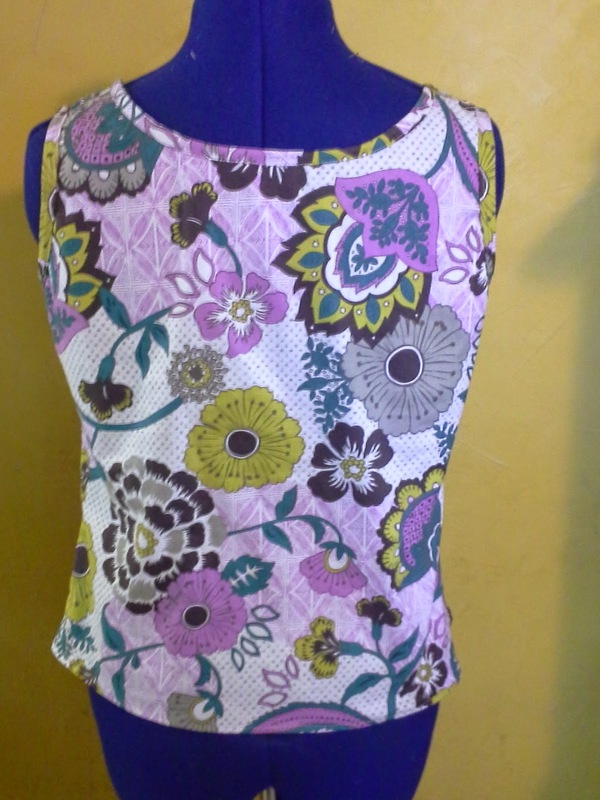 Yesterday I said I started on a Sorbetto, a free top pattern from Colette Patterns. Can you say "quick and easy?" These were tremendously fast to put together. The longest was in pinning the bias tape. I made both in less than 3 1/2 hours. The first was from fabric that I bought earlier this week. I found it on the Red Tag table at my local Joann's. It was marked down to $5 a yard and was 1/2 off. So, for $2.50 a yard, I was okay with a potential wadder. A wadder is a project that is so frustrating or hideous that one wads it up and tries to forget it ever existed. The plus was that when I asked for 1 yard, there was an additional 3/4 left that I could get for an additional 1/2 off. I took it. So, this top is $3.75, oh, but there is another 10% with my VIP card. Unfortunately, this is close enough to our sales tax that I just don't count it. I was hoping that I might even get a skirt. This is a quilting cotton. So, I definitely washed it in hot water and then dried it on hot. I really wanted any shrinking to happen before I sewed. In reading about others experience, I did a quick paper fitting. I ended up moving the dart down about and inch. Then I quickly cut the fabric. 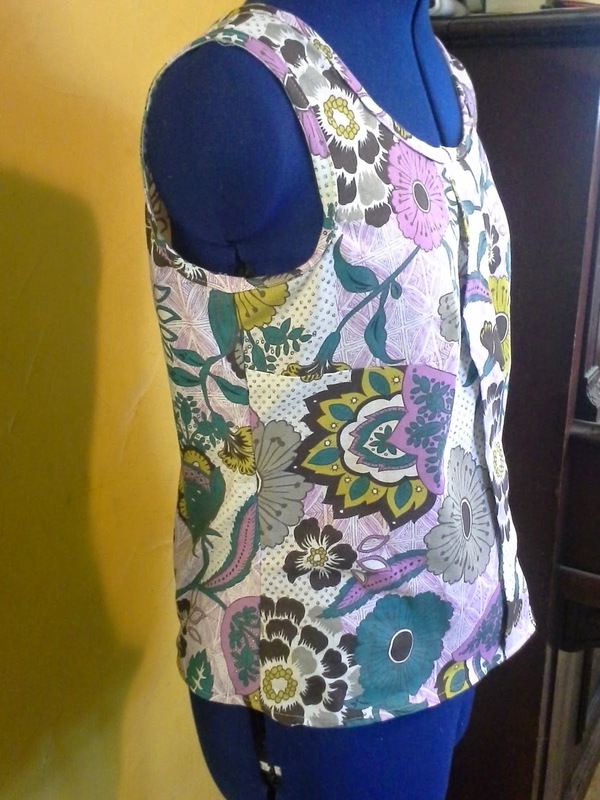 Because I had folded the right sides together, I immediate sewed the front pleat, followed by the darts. Then, I pressed the darts and the front pleat. Sewing the rest was easy. Just sew the shoulders, and side seams. 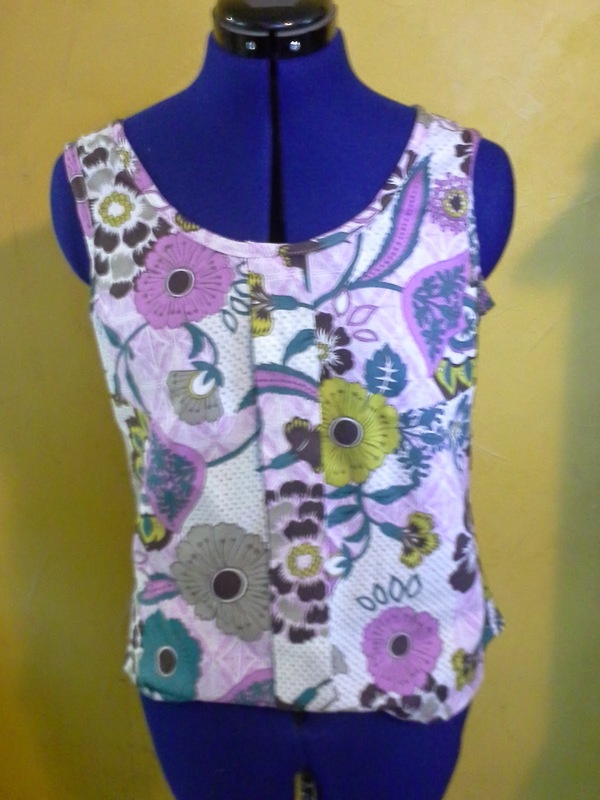 I also stay stitched the neckline and the armholes. Then I had to try it on. I loved the way it fit! This encouraged me to cut 1 inch strips to make the bias. The pattern instructions say to have the bias facing exposed. I decided to actually follow directions--I must have been in a weakened state to follow directions! Once I finished the first, I ran to the dryer and grabbed the second. This is a blue, green, purple, black, magenta abstract embroidered crinkle cotton from the remnant bin. There was supposed to be 7/8 of a yard, but it was cut very crooked. I don't know if the crooked was to my advantage or not. I was able to match the pattern--yes, there is a pattern. There wasn't much left for a bias tape, so I am saving the extra for.... Needless to say, if I find this fabric, I am buying more, much more. I want some to hoard. This went together even quicker--except for sewing the pleat with wrong side together that had to be ripped out. Once back on track, I decided to see if I had any matching single fold bias tape to finish it up. My dad's mother, Grandma Vi, had a huge sewing room and stash. Unfortunately, I was not allowed to pack the whole room and take it. She passed away in over ten years ago and I am still using the odds and ends that I did manage to get. How cool is this? 10 cents! labor and all materials if it is faulty? A company willing to send suppies? Using the pre-made bias tape went much faster. I saved a few minutes, but probably lost it in reading the package it came in. Oh the good ole days.......I love that they sent spare trimmings for doll clothes. LOVE IT! Your Sorbettos completely inspired me. I just finished a really cute Kelly skirt yesterday but have no tops to go with it. I really ransacked my closet looking for something too. LOL. I think this pattern may be perfect. Thanks! Don't you wish they did that now? Maybe we could get kids to want to sew if they could get something FREE. I was also ransacking my closets and drawers and piles looking for combinations. Needless to say I am now sewing lots of simple stuff quickly. Some of my me-mades are wrong season, too big, or just not for everyday. This is a perfect 1 yard project. Ha, ha! I wish they would still reimburse for labor; I've never heard of that. 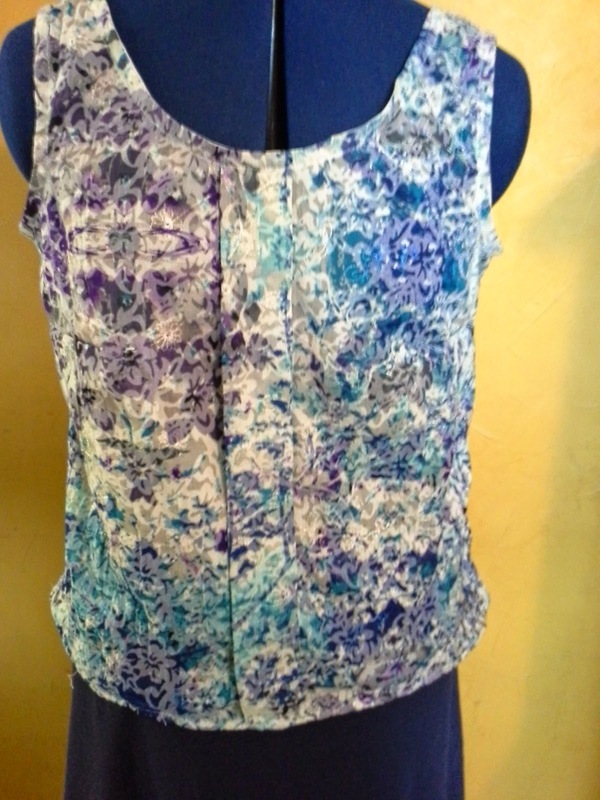 I love both tops, esp the crinkle cotton one. I'm definitely buying that fabric when I find it. Remember that back before the day, women's labor didn't count for much monetarily. I haven't made the sorbetto yet, but it always looks so nice - and you have made yours in such a pretty fabric. Thank you, Sarah Liz. I like both fabrics equally, but for different reasons. Your sorbettos are gorgeous! They are perfect for summer. This is another one on my list. I am glad to know it comes together easily. I saw a friend who bought a top much like the styling of the sorbetto, but no pleat, and it had an accent of lace near the armholes. It was bee-U-tiful!!! I love vintage packaging and ads! Very cute sorbetto! Thanks, Shawnta. The sorbetto is very easy and pretty classic. The packaging was very interesting. 10 cents for the bias tape!